578 pages | 60 B/W Illus. Unlike customary discussions of cloud computing, Guide to Cloud Computing for Business and Technology Managers: From Distributed Computing to Cloudware Applications emphasizes the key differentiator—that cloud computing is able to treat enterprise-level services not merely as discrete stand-alone services, but as Internet-locatable, composable, and repackageable building blocks for generating dynamic real-world enterprise business processes. 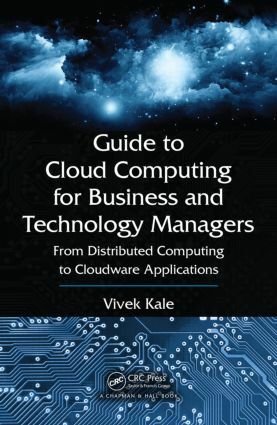 "Vivek Kale has done a wonderful job of putting together comprehensively the technologies and paradigms in the past that have shaped and evolved into today’s cloud computing solutions for businesses. He has also done a great job in defining a new cloudware paradigm for such innovative applications of the future." "Vivek has written a comprehensive study of the technical and business impacts and implications of cloud computing." What Does a Private ASP Offer? Vivek Kale, M.Sc, M.Phil, has more than two decades of professional experience in software engineering, managing ERP, CRM, and extended-ERP projects, and designing, developing, and consulting on large application software, e-Business, knowledge management, and data warehousing solutions. He has worked with international consulting companies including Tata Consultancy Services, Covansys US, and i-flex solutions (acquired by Oracle Corp. in 2007). A popular guest lecturer and keynote speaker, he is the author of four books and has contributed to articles in premier Indian publications such as Economic Times, Times of India, Dataquest, and Express Computer.